Jeffrey shows his friends that his food allergies do not keep him from being a normal kid. Jeffrey demonstrates how to keep his allergies under control by understanding his limitations and making sure what ingredients are found in foods. 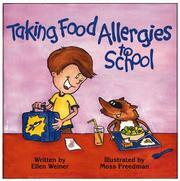 Weiner, Ellen, “Taking food allergies to school,” Children's Picture Book Database at Miami University, accessed April 21, 2019, https://dlp.lib.miamioh.edu/picturebook/items/show/6379.